We are only minutes away from our spring break…ahhhhhh, 11 days of rest and relaxation! 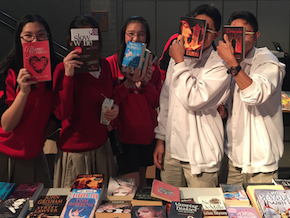 So what better way to get into the restful mood than by CISPA’s annual book swap event?! 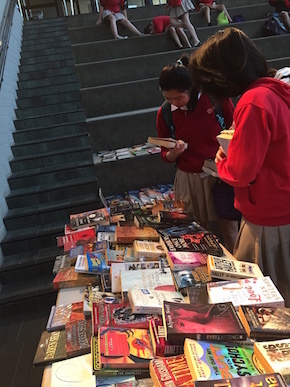 At lunch today (and well into block 4) we wandered along the tables looking for a book (or two, or three, or four…). I got four books: two Lonely Planet travel guides to hopefully be used later this year, a historical fiction set in the Tudor times, and the autobiography of rock star Eric Clapton. 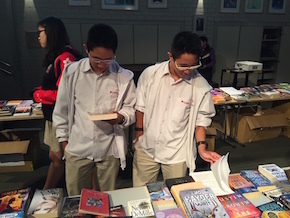 Ms Kathrine Garment from CISPA said there was a good mix of males and females, including students, staff and parents, who were browsing for something to read. She believed it was a successful book swap given the timing of the event so close to the break. 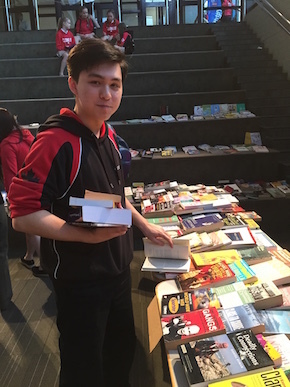 Additionally, this active CISPA volunteer mentioned that students were not only recycling books and find something new to read, one student even bought books to use in an upcoming art piece!! If you didn’t get the chance to pick up a book today during the swap, that’s ok. You can log onto OverDrive and borrow books during spring break. A handy reminder: students-use your student ID as the library card number and password (drop the zero at the front of your student number); staff-use your four-digit staff ID number to log in (drop the ‘p’). There are so many books, both classics and new releases, that you can read! Get involved with The Reading Tree!